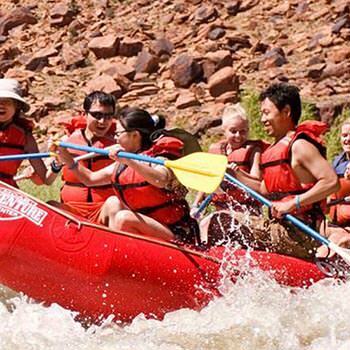 "MOAB – more than an adventure… "
All of the guides working on the day of our Colorado River Full Day Rafting Trip really made it look easy, but of course that reflects their experience and confidence. Really a great group of people. The folks in the store were equally helpful and had the answers to all our questions. This was the second time I've gone with the Moab Adventure Center and I'm sure it will not be the last. The level of professionalism exhibited by the Moab Adventure Center and its employees goes a long way establishing confidence in a business where risk is part of the equation. Looking forward to the next time! We had a great time on the Colorado River Full Day Rafting Trip. Megan was AWESOME!! She is an excellent guide – she was very knowledgeable about the river and its features, the area around the river and its history/features. She kept us all safe and ensured she did her best to make the trip a fun experience all at the same time!! She truly made the trip for our family. Our kids loved her and hey – she got me back into the boat safe and sound after each swim – no small feat!! THANK YOU Megan for a wonderful day of rafting on the Colorado River! We loved this adventure and would highly recommend it to others! Our boat's river guide was fabulous, the lunch was terrific and the scenery and time in the great outdoors is truly an amazing experience for the whole family. The Colorado Full Day Rafting was fun! Kiefer (our guide) was AMAZING – polite, friendly, knowledgeable, and competent. Fun day on the river! My kids loved the Colorado River Full Day adventure! We hope to do it again. Andrew was a top notch guide and made the trip fabulous!!!! EVERYONE we encountered was excellent from the staff at the Moab Adventure Center who picked us up and dropped us back to our accommodation, sales staff, bus driver and other guides (Alex, Cade and Taylor.) Keifer, our guide for the Colorado River Full Day Rafting Trip, was AMAZING. We as wells as our kids really enjoyed having him as our guide. He should be congratulated on his friendly and bright personality, knowledge of the area, interaction with guests and most importantly, rowing skills. Well done Keifer. Of our week long RV trip this has been the highlight so far. Our Colorado River Rafting Trip was better than excellent!! I wish we could do it again next week. I appreciate the fact there was something for our entire family to enjoy at any given time or place. The younger, active ones stayed busy and the grandparents enjoyed themselves as well. Thank you very much!! Absolutely the highlight of our RV trip around the US. From the start, the reservation service was top notch and the communication with the Moab Adventure Center ensured a great day. We opted for the full day river rafting and we are so glad we did. Lunch was great and tasted even better when we saw other groups from other companies stopping for a sandwich and a juice. The best part of our day however was the high standard of the guides, especially ours (Keifer). He was great with our kids and ensured that this was our holiday highlight. Highly recommend to other travelers. Jacob was our guide on the Colorado River Full-Day Rafting Trip. He was very knowledgeable of the area as well as entertaining. He made our trip really fun, our kids loved it. Great guide, I hope he returns next summer. The full day was very relaxing and fun. The food at Red Cliffs Lodge was excellent too. We had a fabulous time. Jacob even had us paddle upstream a couple of times so that we could experience the rapids more than once, awesome! Moab Adventure that we’ll treasure forever! The guides that were on our Colorado River trip were excellent! They do your company a great service, you should be very proud of how they handle the trip, themselves and how they represent the Moab Adventure Center! We just returned home to New York after a two week vacation in Utah. Without question the time spent with the Moab Adventure Center was the best part of our trip. Memories that our three children (ages 6, 8 and 9) will treasure forever. It was an amazing time, we look forward to doing another trip with the Moab Adventure Center next summer (we are counting the days until we return). Thanks for running such a great trip and adventure center. All Day rafting trip – FUN!! We took an all day rafting (level 2) down the Colorado River – 2 adults and our children ages 19 and 23. My wife and I loved it, and the kids also had a blast. The staff was helpful and courteous. Amy, the river guide, was great – she explained the river, the scenery, history….best of all she got conversation going between the group and the 9 of us had a blast. The luncheon was outstanding!! Just a great fun way to spend the day in the outdoors. Choose this company for your rafting experience! If you are like me, you really don’t know who to book with if you’ve never been to Moab before. From the first phone call to the foot wash after the trip, this company is top notch. Our family (kids 19, 14, & 12) had a great time on the Colorado River Full Day rafting trip. The guides were fun and talkative, the lunch was fabulous (out of the water and on a lodge covered deck) and the equipment was perfect. The Moab Adventure Center is also very nice. You’ll be impressed as well, I have no doubt. The Moab Adventure Center goes above and beyond expectations. Call them….you’ll be glad you did!